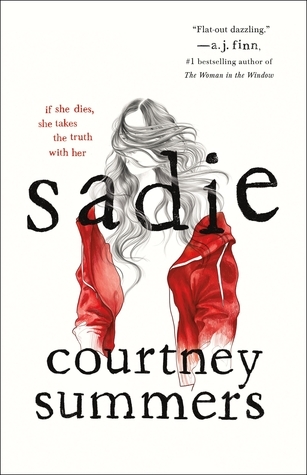 I went into Sadie by Courtney Summers knowing I would love it. So many of my favourite and most trusted reviewers gave it rave reviews. They made me desperately want to get an eARC of this one. Unfortunately, that didn’t happen, but as soon as it released I basically jumped on it. I had it sent to my Kindle and tried to read it as fast as I could around work experience, and I succeeded because this book was so damn easy to get through. It was a heartbreaking story that really looks at the nitty-gritty members of society. This book focuses largely on themes of child abuse, sexual assault and murder. It is a heavy book and needs to be recognised as such. Sadie is told in dual perspectives. One is the current time period in which a podcast has been recorded that details the missing status of Sadie, interviewing her family and those who she came across as she travelled. The other perspective is of Sadie. The journey she took, what she did and what her goal was. As the story unfolds we learn how difficult Sadie’s life was. With a stutter, a drug-addicted mother and a young sister who saw her more as a parent it was difficult for her to get the upper hand. It only gets worse when her younger sister turns up murdered after being missing. No one is ever charged and she is simply forgotten. However, Sadie doesn’t forget and Sadie is determined to find out and to make them pay. I really don’t even have words. This is one of the most heartbreaking stories I have read. It will be a story that stays with you for a long time. It is truly a story of one that reflects the horrors that are hidden from this society. Everything in this story was so realistic. Almost everyone is to be viewed as an enemy to Sadie and it is unfortunate that I have met many like these people. From the drug-addicted mother who neglects her children, and favours one, to the horrific men that she wheels through their lives. The portrayal of the abusers is also incredibly well done. They are typically charming people and Courtney Summers paints this incredibly well. She makes sure that these characters have every possible layer. I am still slightly breathless and I read this book over a week ago (review going up much later). This whole format of the story was incredibly interesting. From the podcasts to Sadie’s inner monologue. It was something that had me completely in love with this book from page one basically. I could have done better if this book was told from Sadie’s perspective completely, but that is me being incredibly picky about this story. The podcasts really added a whole new layer to the story and one that I would be interested in reading more of. The format was different and the way that it added the background of the story was one that gave me just enough and wanting even more. Sadie is also one of the strongest characters I have read about. She definitely isn’t a character who is likeable. She has her flaws and is completely one minded on her mission. She doesn’t do the most orthodox things and with her background, it is clear that she is not respected by society. However, she was strong. What she had battled with her entire life and even the snippets of PTSD throughout the story were mind-blowingly accurate. Courtney Summers has a talent for crafting emotions and it is so bloody clear throughout this. The main focus of this story is that young girls struggle to feel safe. That when they think they are safe terrible things can happen. The grimy layer of society that is revealed throughout Sadie is one that will make you feel sick to your stomach. Overall, I can’t recommend this book enough. Please adhere to the trigger warnings as well. This book focuses heavily on these things and it could be extremely harmful if you are unprepared. I really think this is a story that needs to be read by the world, but please practice safe self-care methods. Great review! I read Sadie months ago and til now, the story remains with me. It has to be one of the best books of this year. Thank you so much! It is truly a story that reflects the darkest parts of society. So gritty. Wonderful review Amber, I’m so glad that you enjoyed it! The ending of this book still has me asking questions! Have you listening to the audiobook? I’ve heard that it’s pretty good! I’m definitely going to listen to the audiobook! Everyone seems to love it! This is such a fantastic & well-written review! I honestly can’t wait to read this book. Thank you so much Dezzy! I hope you love this one! Sadie sounds amazing, although I probably won’t pick it up for a while because of how dark it is. I really enjoy books that comment on today’s society and I love mixed media books! It really is Cindy! I hope you enjoy it when you do pick it up. It’s definitely one that you need to be in a good frame of mind for! I am excited to read this book soon! Great review! I also only heard good things about it. Planning to read it with the audio. Thank you so much! I’m planing to re-read through audio honestly, it is seriously amazing! Wonderful review. I’m hoping to get this book soon. I know I will love it but I also know it will be a rough read. Def going to get to it though. Thank you so much! I hope you like it when you get to it! It’s such an important story! Great review! I have a copy of this book but haven’t been in the mood to pick it up yet, but I am really looking forward to it. Thank you so much! I’m super interested to see your thoughts on this one!